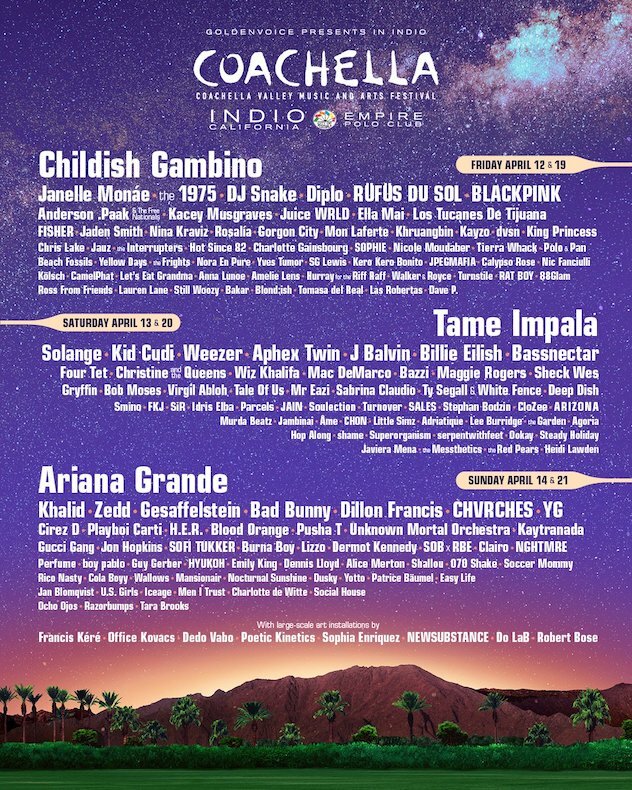 Coachella has shared the full line-up for its 2019 and it looks like there’s going to be a lot for dance music fans to enjoy. The festival, which takes place at Empire Polo Club in Indio, California, will feature the same enormous line up over its two weekends (12th – 14th and 19th – 21st April). Among the dance and electronic music acts set to play are Aphex Twin, who will be making a rare North American appearance, and SOPHIE, whose album ‘Oil Of Every Pearl’s Un-Insides’ came out on top of our Top 50 albums of 2018 list. Also set to play are Four Tet (who also recently announced a massive live show in Alexandra Palace), Amelie Lens, Nina Kraviz, Tale of Us, Hot Since 82, Ross From Friends, Diplo, Charlotte de Witte. More acts confirmed to play include Jon Hopkins, Yves Tumor, Stephan Bodzin, Âme and Idris Elba. Headlining this year’s festival are Childish Gambino, Ariana Grande and Tame Impala. Kanye West was reportedly offered the headline spot but allegedly turned it down due to disagreements surrounding stage production. You can see the full line-up below. Passes for the festival go on sale this Friday 4th January at 11 AM Pacific Time.